What type of grease do you recommend? People have varying preferences on grease grades / brands / types. We use a good marine grade grease, simply because it will repel and resist mixing with any potential water contamination. Most synthetic or good quality grease will do the job well. How much more life will I get from my bearings? Depending on your riding style and environment, it all depends. How often you grease the bearings, how often you ride, and how extreme the environment can factor in to this equation. We can say this – keep your bearings greased and your bearings will last significantly longer – perhaps 2 to 3 times. We cannot stress this enough – ALWAYS re-torque your bearings at assembly to the proper manufacturer’s recommendation in their service manual. Bearing preload IS just as important as greasing your bearings. Read up in our blog spot for more on this topic. How often should I grease my bearings? This depends on how much water and mud riding you do. There is no set schedule. We recommend packing your bearings, ride a few rides in your typical conditions and then re-pack the bearings. Based on what come out of your bearings on your second round of greasing will help indicate how often you need to perform this as routine maintenance. Won’t the seals on my bearings get ruined from pushing grease out? Firstly, greasing your bearings shouldn’t be a NASCAR type pit stop where seconds count. Simply take your time and pump the grease into the bearings slowly and keep an eye on what is happening. Secondly, unlike other tools that sandwich the races together, our tool allows the inner races to relax and pull away from the seals. Once you pack the bearing with grease and assemble your axle setup, it will reseat your seals properly without damage. Won’t over greasing cause more my bearings to overheat? In typical car, traveling thousands of miles per year, at highway speeds, over greasing may cause issues. However, ATV / UTV bearings fail due to LACK of grease and are typically used at slower speeds with far less miles than an automobile. More grease in the bearing give less space for water to accumulate. We have never seen an ATV/UTV bearing fail due to over greasing. What do all those numbers mean in the part number of your tool? 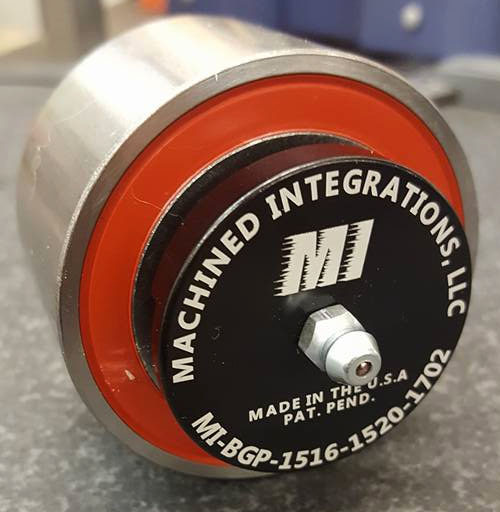 Since most of our tools are made for more than one application, we have come up with a part numbering system that helps identify what bearings a specific tool will fit. We use the last four digits of the bearing number and apply it to our tool’s part number. This is one of the advantages to using our tools, most fit a wide range of bearings. Do I need to remove the hub from my machine to use your tool? No. The tool was designed to use right in the machine. Do I need to pull my axles? No. You do not need to remove your axles from the differential. You simply need to slide your axle out from your bearing. Most applications only require you to either remove the upper or lower ball joint from the control arm. This will allow you to tilt the hub out enough to allow the axle to slide out from the bearing. On most Polaris models, that means removing one bolt from the ball joint.